Are You Retirement Ready? See The 8 Dates To Heed To Make Sure! Are you ready for retirement? You may be shaking your head no right now because you are not at the age of retirement yet. Just because you are not old enough o retire does not mean you cannot be ready for retirement. A recent study showed that of the people who are at the suggested retirement age of 72, less than half are able to retire. As a matter of fact, a new report on retirement tells us many people are saying 80 is the new retirement age. Granted, we are living longer and are able to stay healthier, but is that the real reason folks are waiting until they are 80? No, it is because they were unprepared for the cost and they cannot retire on what social security alone will provide. Financial analysts across the country are urging people to contact a financial planner to help them with their retirement. If you are working towards your retirement, are your finances protected?There are several dates you need to know about in order to ave your retirement fund. 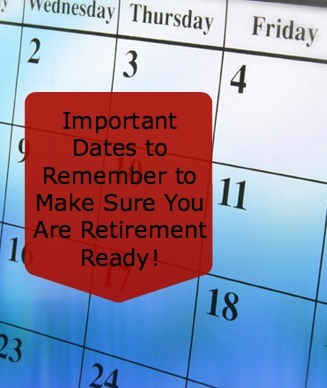 Genworth Financial wants to ask if you are retirement ready and if you are aware of these dates. If not, they are there to help you get there. Age 50: At age 50 or older, you can defer taxes on as much as $23,000 in 401(k) plans, 403(b) plans and the federal government’s Thrift Savings Plan and $6,500 in IRAs in 2013. Age 55: If stop working for any reason when you turn 55 or later, you can take 401(k), but not IRA, withdrawals from your most recent retirement account associated without having to pay the 10 percent early withdrawal penalty. Age 59 1/2: You do not need have to pay the 10 percent early withdrawal penalty on retirement account distributions once you turn age 59 1/2. Age 62: If you want to retire at 62, your social security benefits could be reduced by as much as 30 percent. Eligibility for Medicare begins at age 65. You can sign three months before you turn 65 if you want coverage to begin the month you turn age 65. If you don’t sign up right away, your Medicare Part B and D premiums could permanently increase, and you could even be denied supplemental coverage. Age 66: If you are a baby boomer (born between 1943 and 1954), this is when most baby boomers become eligible to collect the full Social Security. People born in 1960 or later who sign up for Social Security at age 66 will get 6.7 percent smaller payments than if they wait until age 67. Age 67: The Social Security full retirement age is 67 for everyone born in 1960 or later. Age 70: If you wait to begin signing up for Social Security benefits, your payments will increase by 8 percent per year up until age 70. Age 70 1/2: Distributions from traditional IRAs and 401(k)s must be taken and income tax must be paid on each withdrawal. If you withdraw the incorrect amount, the tax penalty is 50 percent of the amount that should have been withdrawn. With the experts at Genworth Financial, they are very well aware of these dates. They are prepared to walk you through the entire process in great detail. They will explain how to set up the proper accounts and help you plan for the dates to come. They have budgets to help you plan for retirement without breaking the bank now. They also can help you with your long term care, financial panning and life insurance needs as well.